If you are wondering when the best time to start beekeeping is, it is this year, 2018. In this article you will see the best types of beehives as beekeeping can be both fun as a hobby, and productive in health and wealth. So it really does not matter whether you want to use it to pollinate your crops or make money from it. The most important equipment you need is the beehive which is usually a cone-shaped box where the bees are kept. Most of them come in a wooden form. The essence of this article is to offer the much-needed information about the business of beekeeping and how to carefully select the best beehive that suits your needs as well as your budget. The beehive product basically serves the purpose of safely keeping and nurturing bees either so it can yield honey in large quantities or if you want to use it to pollinate your crops. Also, our aim is to reveal clearly the advantages and disadvantages of how to use various types of these beehives. We have meticulously researched the best types of beehives you can ever find for your beekeeping. There are several beehive boxes in the market which has different designs based on their capacity and size. We shall try to answer key questions that is required, to avoid any unforeseen errors that may arise during purchase and use. Like I mentioned earlier, a beehive is usually a wooden box where bees are being housed. They come in various shapes, designs and sizes based on their usage capability. What does Beehive Box do? Beehive boxes are used to protect bees from extreme weather and all forms of attackers. How does a Beehive box work? These boxes both serve as shelters and spaces where food for bees are stored and a space where honeycomb is being produced and kept. What is the average price range of a beehive? A beehive can be bought based on size. The quantity and weight of bees to buy also play an important role here because a typical package of a swarm of bees weighs about three pounds. So, you can start with 75 dollars worth of beehive with complete kits. 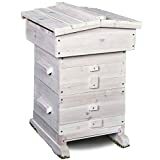 Where can I buy a good beehive box? Most of these products are in the market; including online stores like Amazon, Alibaba, eBay, AliExpress.com and a durable one that was assembled by an American company called Mann Lake and Ware manufacturing. We have reviewed the products based on the different factors like its features, pros & cons, price, where to buy and the warranty it offers. A thorough research was carried out to determine credible products that will ensure maximum productivity for its users. Therefore, the list of products below are varieties of top best beehive products that comprises state-of-the-art equipment, durability and affordability. Starting a beehive depends on your budget. Depending on who you buy from and the selections you make, you should expect to spend $80-180 on a package of bees. A complete beehive kit with about ten frames and a space for the queen is more expensive than the type that excludes the queen. You can start your budget at about $190. We therefore recommend that you observe the progress of your beekeeping for at least one year so you can know what extra equipment you need to buy and how to expand. The 8 frame standard beehive starter kit is suitable for both beginners and established beekeepers alike. Because it is affordable, it makes it easy to start beekeeping with it. The wooden frames are of high quality and all the other equipment and tools that come with the unit are worth every dime. The unit in this beehive has all you desire of a beehive kit. Even though the unit comes unassembled, it is really a no difficult task to connect its components. One beautiful feature it has is that it is resistant to insects and is highly durable. It has an opening for airflow which helps protect the bees from harsh weather. It is easy to assemble its parts together. You might add new boxes below should you want to expand. The wood make-up helps to resist insects. You can buy from Ware Manufacturing Home on Amazon in the United States of America. It is built to last for 10 years. The Cedar 6 Frame Langstroth Beehive unit has incredible design structures. The brand, Flow, has been a household name. Its brood box has 6 normal frames without a bottom and the bee collection box and then, it comes with a Flow Key. The unit is easy to assemble; that is why it is distinguished among others. The roof guides rainwater away from the hive and also accommodates the bees from the sun. The key features of this product include complete box kit which is designed to accommodate about ten medium frames. These frames are made up of white pines while the little space for bee collection is made up of premium firewood. This box has a little space that prevents any form of attackers. It has a fully assembled bottom board which provides space for an entrance reducer. Does not come with frames. You have to buy one separately. Its key features include a fully assembled and ready to house bees. 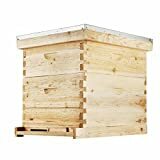 The 10 Frame Completed Hive Kit is made of pine wood, and it is specially manufactured in the United States of America by Mann Lake and has an average height of 13.5 inches. Also, the assembled hive kit weighs about 31 pounds. If you are looking to get a good beehive box, this 10 Frame is one of the best types of beehives you need in 2018. It has an outermost aluminum lid protecting it from harsh weather. The bee keeper to remove the wood frames from the hive kit because the honeycomb is mis-aligned with the wooden frames. Can last for 12 years if well maintained. This is another amazing beehive kit that comes with several tools and accessories that are required for beekeeping. The components feature a Two Frame stainless steel manual honey extractor and a whole set of beehive kit. All the internal and external units of the beehive kit are wonderfully remarkable. It is long-lasting and works well. It has accessories that are suitable for new starters. It comes with a hive lid that is located in one of the inner units. It has a stainless steel manual honey extractor. It come with a complete set of beehive kit. This Honeybee Beehive starter kit is packaged with essential beekeeping equipment even though it has no honey extractor. It is, however, suitable for starting out or expanding your beekeeping business. The brand is well recognized and has been proven to be durable for bee keeping. Very strong and long lasting for bee keeping. It comes with a beekeeping book to enable you go through basic Instructions in Bee keeping. An amazing feature it has is the two deep litter beehives which can carry about twenty frames. The product has the ability to last for over 12 years. Key features of this product include an impressive interior and exterior features. 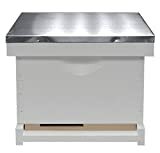 It is also popularly accepted due to its price, quality, durability, capacity and compatibility of hive accessories. In addition, it comes with two Goodland bee supply boxes and one shallow hive box. Features of this product include an ideal environment to take care of the bees. This is so because it is made of soft pine woods and comes with a bottom board. This beautiful box comes with a queen excluder that helps prevents the queen from attackers. The soft pine wood is susceptible to break if not handled with care. Features for this product include a complete kit, all necessary hardware for assembling and the ability to accommodate about twenty frames including a queen excluder. It comes with a beekeeping book to enable you go through basic Instructions in beekeeping. It can last for 8 years if properly managed. After reading through the assortment of the varying types of beehives, it is refreshing and almost adventurous to know the wonderful options out there in terms of beekeeping. Beekeeping is fun and rewarding when you really know what you are doing. And having more knowledge on the various beehives does really help in giving clarity and perspective on what it entails briefly so you know what exactly to expect.